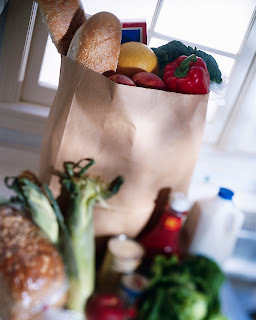 Feeling the pinch of the current economic downturn on your grocery budget? There are a few, simply ways to trim your food budget, and just possibly trim your waistline in the meantime. Eating on a budget doesn't have to mean giving up on healthy whole foods. 1: When it comes to produce buy local. Choose produce that is in season and locally grown. Frozen produce is also a great alternative. Did you know frozen fruits and veggies are just as nutritious, if not more nutritious, than the fresh fruits and vegetables in the produce section? Frozen fruits and veggies are processed at peak ripeness, blanched (which causes minimal loss of soluble vitamins B (thiamin) and C, then flash-frozen, all within hours of being picked. "Fresh" produce found in grocery stores, on the other hand, is picked before it is completely ripe, so isn't given a chance to fully develop all of its nutrients, then shipped to its destination. In that time, it's exposed to oxygen, heat, and light, which results in the loss of important vitamins, specifically vitamins B (Thiamin) and C.
You can use frozen produce in soups, stews, stir-fries, side dishes, and more. Try saute spinach with garlic, cauliflower mashed potatoes, or a vegetarian pasta dish.Frozen fruit: Add this to muffins and/or pancake mix; use in smoothies; blend and heat for a topping for pancakes, waffles, yogurt, or oatmeal; top warm berries with a dollop of frozen yogurt or whipped cream. 2. Focus on the grains and not protein. Rice, pasta, and grains are a good way to round out a meal. Try to choose whole grain foods whenever possible. Brown rice is a whole grain, high in manganese (useful for energy production, and an antioxidant) and selenium (an antioxidant, helps prevent colon cancer), as well as important B vitamins (Thiamin and Niacin, which are lost when refined). The benefits of choosing whole grains over refined grains are numerous. To name a few: weight loss, increased satiety, stabilizing blood sugar, cancer prevention, prevention of heart disease. Rice is a very versatile; it can be used in soups and stews, stir-fries, beans and rice, rice salad, rice pilaf, rice and bean cakes, rice pudding, and even healthy fried rice. 3. Invest time, not money. Forgo the convenience foods and focus on preparing dishes yourself and involve your family. While it might seem daunting to give up prepared foods, the premium you pay for someone to prepare foods for you will be invested instead in spending time with your family and cooking healthy alternatives. Here are some great low cost recipes. I've switched to brown rice and now that I have, I would not go back to white. The brown rice is nutty, hearty, flavorful. Real food.